Think of Philippines and you think of palm-fringed beaches coconut in hand. Few people include Manila in their sun-seeking travel itinerary. But that’s a mistake, Manila may long have been associated with Dunkin Donut invaded shopping malls and endless traffic jams, but there’s a new wind blowing. There are some pockets in the old city, where its tired heart is pulsating with a new energy. A creative crowd has rediscovered the old gems and decaying buildings in the city’s forgotten corners. Cool café’s, co-working spaces, art galleries, artisan markets and speakeasy bars pop up as part of an artistic revival. A testimony of a new generation of Filipinos reconnecting with their past and proud of their heritage. 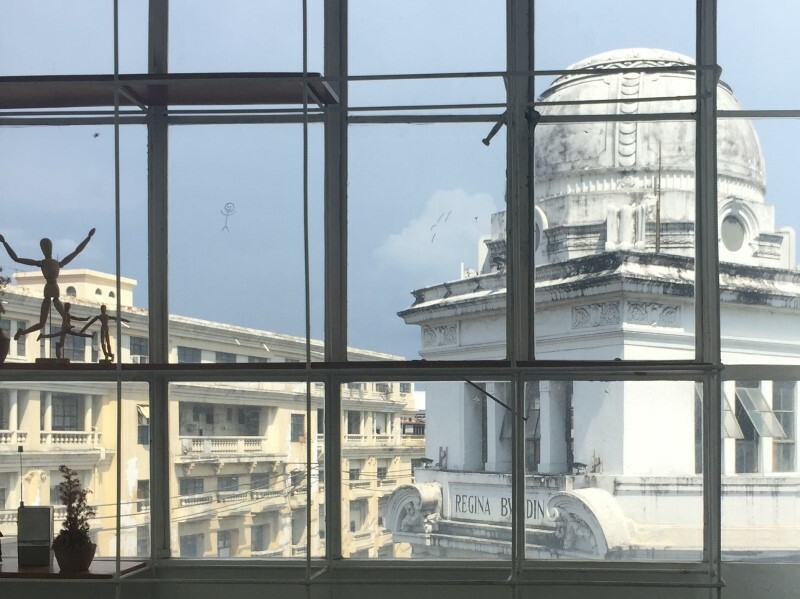 We went for a little wander in Escolta Manila – to see what was new in the old town. 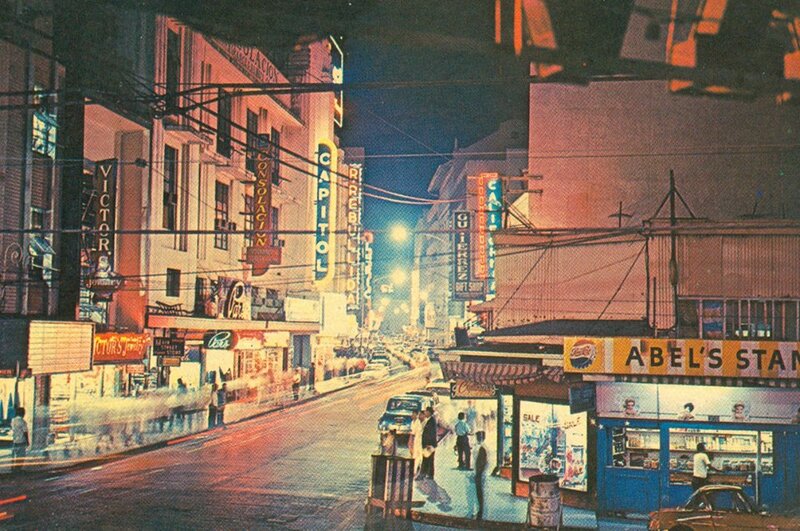 Escolta, an almost forgotten street filled with crumbling buildings and romantic memories of a memorable past. Neglected for years, Escolta is now infused with an infectious mix of pop-up shops, craft beer café’s, street parties and lots of creative energy. The cool youngsters bring a new élan to this old street as they set up shop in the turn-of-the-twentieth architectural jewels that made Escolta Manila’s premier boulevard in the 1920’s. Escolta has found its soul once again. 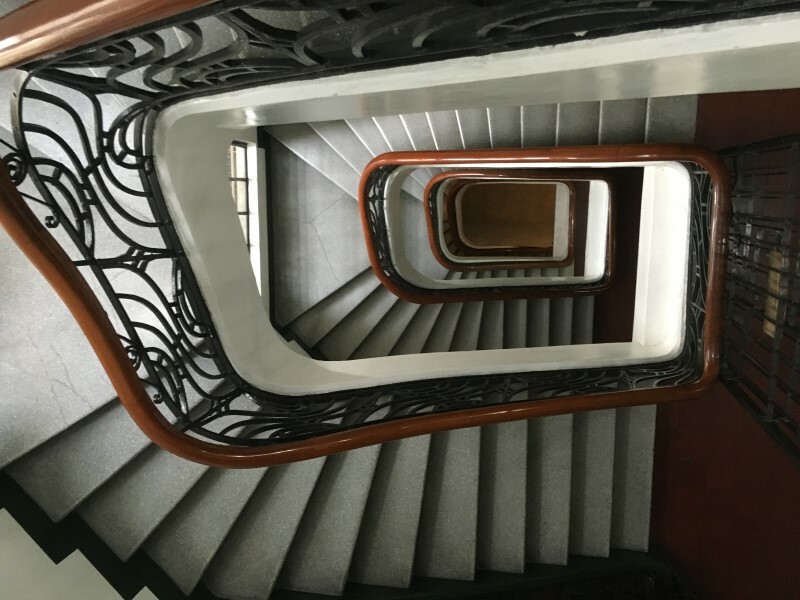 It was 2012 when Marika Constantino, executive director the art collective 98B COLLABoratory persuaded Chinese-Filipino businessman Mr. Robert Sylianteng, owner of the imposing art deco style Fist United Building to rent them a room on the fifth floor. In those days, what was once Manila’s most exclusive department store, had turned into a crumbling office building with mainly dreary currency traders and import/export offices as tenants. The rest is history. Roberto, a heritage advocate at heart, embraced the arrival of the artistic crowd and before he knew it, the building had filled up with architects, filmmakers, fashion designers. 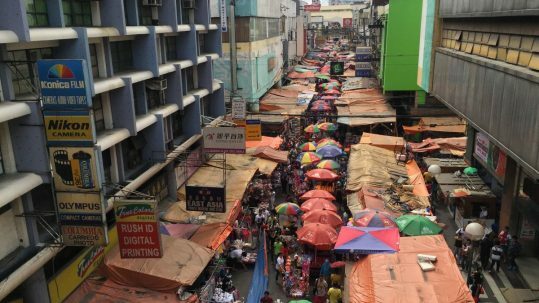 “This was a typical office building like many in the Binondo area, but when I saw that all these hip youngsters with their nice cameras were so interested in the building I decided to rent out a couple of vacant units to them… and it kind of took off from there.” Roberto says. “What we try to do here is find new uses for old structures and engage people to become stakeholders in revitalising this historic area” architect Arts Serrano. Tenants of the 90- year old building now include The Den, an industrial style coffeeshop brewing with locally sourced coffee beans, Fred’s Revolucion, a craft beer café, One/Zero co working space, and Public School Manila, a branding agency. 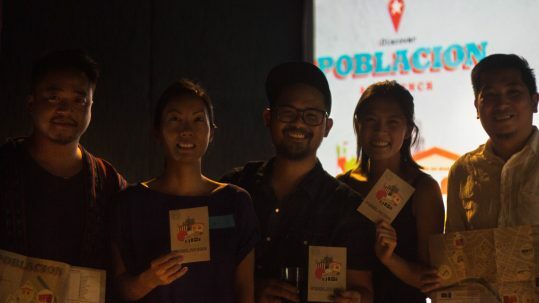 The creative spirits and entrepreneurial spirit peak every three months at the Escolta Block Party. For a whole day the street is shut down and transforms into a giant art market, public cinema and open-air disco. What was once the famous Bergman Department store, is now once again an exciting retail destination. 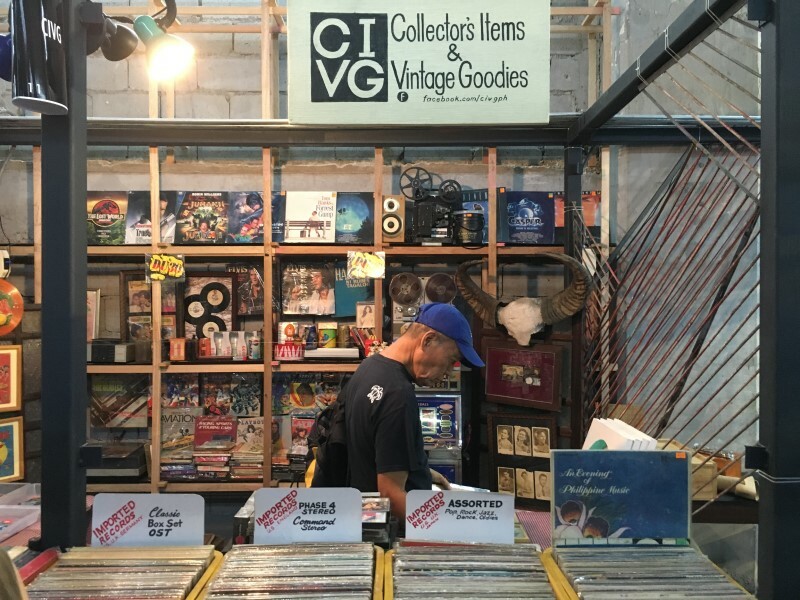 The massive vacant ground floor space of the First United Building has been cleverly redesigned and is now home to a pop-up flea market with locally produced artisanal products: HUB: Make Lab curated by 98B COLLABoratory. What started in 2016 as a Saturday market, is now a permanent fixture with local creatives selling their products and food stalls, exhibitions, talks, coffee tastings, art installations, tours… All inspired spirits can try out their ideas for three months, if it is successful they can stay. “Just restoring old buildings would just create museum pieces for people to look at and appreciate. What we try to do here is find new uses for old structures and organise activities to engage people so they all become stakeholders in revitalisation this historic area.” says architect Arts Serrano. Want to find these places? 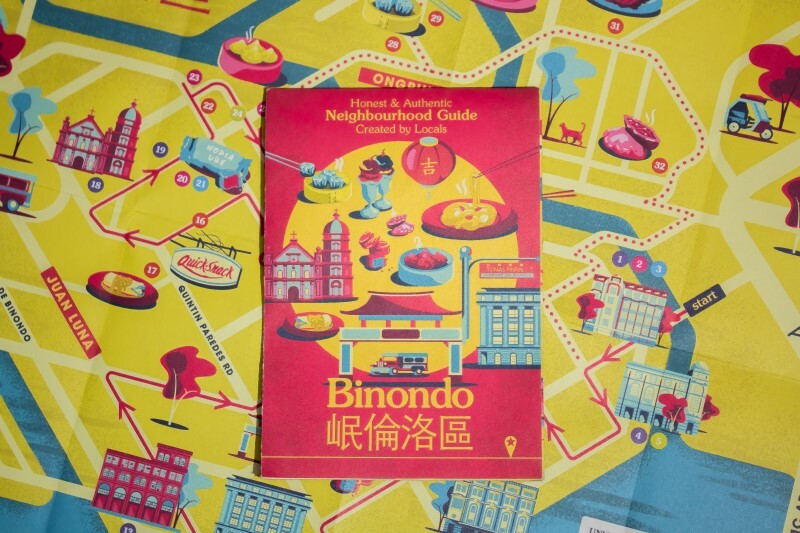 We teamed up with Escolta Commercial Association and First United Building’s tenants to curate an honest & authentic travel guide for Escolta & Binondo. The travel guide comes with an illustrated map and a handcrafted walking itinerary accessible through the iDiscover Manila app, available as a free download here. Thanks for reading Escolta Manila! 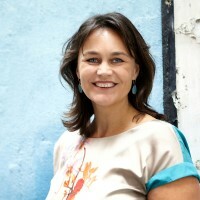 Ester moved from Amsterdam to Hong Kong Just before the handover in 1997… with little more than a backpack. 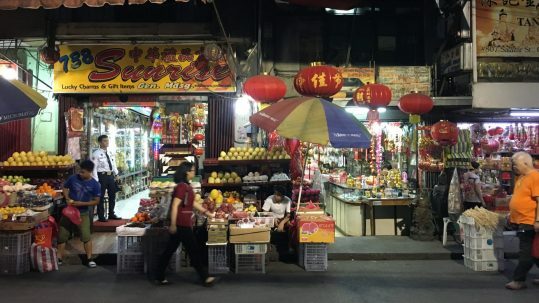 She fell in love with the city’s energy and almost 20 years later, she still calls Hong Kong home; a base from where she works on cultural heritage projects throughout Asia. Her favourite cities include Hanoi, Istanbul and Yangon. In Hong Kong she’s happiest exploring the city’s busy backstreets or hiking in the country parks.